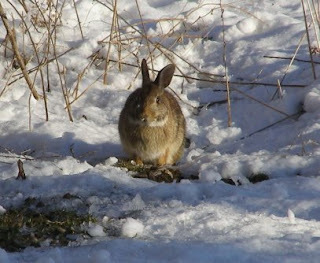 Here's a bunny in my backyard a couple days ago. We had about five inches of snow. Covers up the yucky mud, but just prolongs the suspense of when spring will finally arrive. 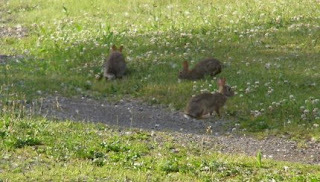 In contrast, here's a picture from late May last year, with three bunnies eating in my front yard near the drive. The dandelions are almost gone--the event I can't wait for each year. Dandelions make the yard look ratty no matter how many times you go over it with the mower. I swear they flatten themselves to the ground until you go over them, then they bounce back up. I live in farm country so treating for them is not an option, but it doesn't stop me from wishing them gone as soon as possible! 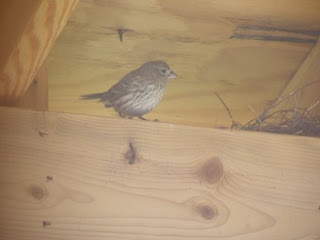 Finches like to nest in my porch rafters. This is from last year (they're not nesting yet this year). 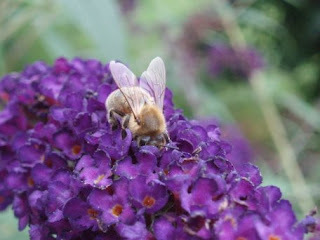 The wonders of super zoom cameras--all the nature photos here were taken through glass at a distance of 8 to 50 feet. I did finish my machine piecing handouts and am now trying to finish the final 5 blocks of my Monthly Bliss 2 class. 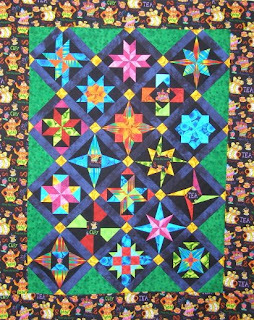 Monthly Bliss has 18 seven-inch blocks set on point to make a 46 x 58 inch quilt top. They are super fun (at least I think so!) and some of the ladies started last year with Bliss 1 and completed 18 to 25 blocks and are back for 18 new ones! It's called Monthly Bliss because I figured something good should happen to women monthly. Here's a picture of my sample. 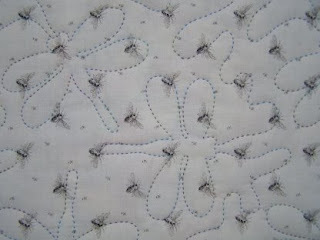 Remember the Thimble Bugs quilt from a few days ago? I thought I would show you the back so that you could really see the quilting. I used an all-over meander that forms dragonflies. Because the front of the quilt was so difficult to mark, I put the design on the backing and quilted from the back. It's so much easier to do that than fight with marking the top. I've used this several times and am always pleased with the results. 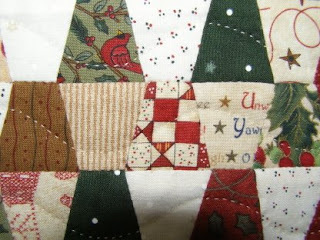 While you are piecing or appliqueing your quilt top, you will know if it is going to be a problem to mark the front. Knowing that, choose your backing fabric accordingly--go light enough to use the silver Prismacolor marking pencil or dark enough that you can use the white Prismacolor or soapstone. 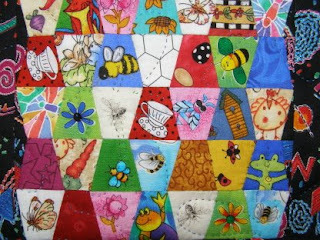 Yes, those are flies on the backing fabric--and I quilted the piece with a variegated thread. Here is a picture of another 5-point star--much more sedate than the pirate/skull one you saw in an earlier post. I like them both for very different reasons--and I have the option of doing both. Try something different--it's only fabric--and if you don't like it, give it to the cat or dog to lie on. They are much less critical of our pieces than we are! Here's my girl--Lynnie. She came from Boxer Rescue in Pennsylvania, where she was surrendered by an Amish puppy mill. They had bred her as long as they could and when they had no use for her got rid of her. I've had her since January 2006 and she is about 6 years old now. She has recently been diagnosed with a thyroid condition and as a result suffers from alopecia negra (spelling?). Her hair is falling out and the skin is turning black on large sections of her back and sides. Her thyroid medicine will at least stop it from progressing, but the hair will never grow back. In the winter she has a nice plaid fleece coat to cover the hair loss, but this summer will see her naked. I think she is beautiful anyway, and I tell her that in almost every other sentence. If you have a dog that is losing hair in strange patterns and has gained weight that is just not coming off, have your vet check for thyroid. It's surprising the number of dogs (and other animals) that suffer from it. 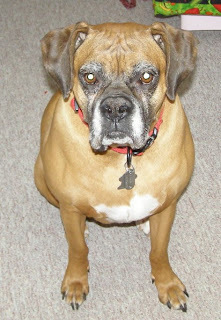 If you are interested in learning more about adopting a boxer, please visit http://www.adoptaboxerrescue.com/. Thanks to everyone who has left comments for me! It's so exciting to get mail! MK asked what I was using to take my pictures with--its an Olympus SP-500UZ 6 mp digital camera. I just love it! 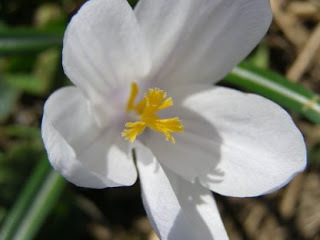 I do resize the pictures for the web so that they load faster, especially for those of us still on dial-up. So if you try to resize them bigger, they may be a bit grainy. I spent most of the day working on new handouts with digital pictures of each step for a machine pieced block of the month class I am teaching. Students have been really happy to have everything laid out step-by-step, and it lets them work along at their own pace. Spend some time today doing what makes you happy--even if it's only for a few minutes. Happy quilting! 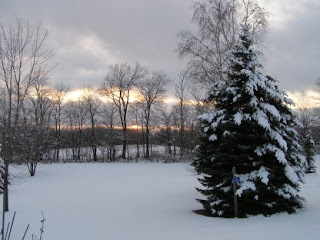 Sunset on Friday brought stormy skies and snow-laden trees. The sky had almost a purplish cast. A good day to be inside and quilt. Although any day is a good day to quilt! 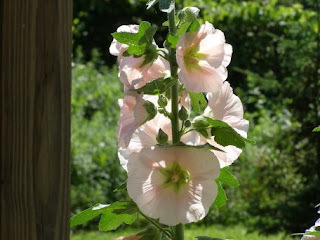 I try to always remember my good friend Anita Shackelford's quilter's blessing: "May you thread your needle every day." Even a few stitches on a project make you that much closer to finishing. And it's not like the dishes and laundry and cleaning--no matter how well you do them, you will have to do them again...and again...and again.... You get the idea. So enjoy some time stitching every day--you're worth it! Sweet dreams to those who are reading this during the wee hours of Saturday morning, and good morning to those of you who are reading it later on Saturday! Success can be measured in small doses. Are you working on a large quilt that seems to be taking forever? Try doing a couple small pieces from start to finish to give yourself a mental boost. 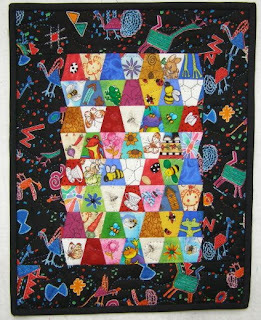 This is Thimble Bugs, with the center hand pieced, the borders added by machine and then the piece was hand quilted. I just finished the binding a couple days ago and still need to do the label, but having a piece this far sometimes seems like a miracle. Here's a close-up of some of the thimbles. Yes, they are tumbler shapes, but actually about the size of a thimble, hence the name. I have pieced and basted one with over 200 thimbles; these two have 56 each. 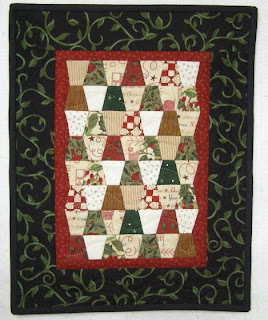 Christmas Thimbles: Second verse, same as the first, just using different fabrics. The fabrics in the center were bought at Lowell Images several years ago. The small reddish border frames the center and I like the way the black vine fabric finishes the piece. Today I taught 10 wonderful ladies the useful art of binding. French double fold, finishing 1/4 inch. We also did hanging sleeves so they could easily display their new masterpieces. The funny story of the day came at the beginning of class--one of the students said she needed to ask me a stupid question. I replied that there were no stupid questions, but she insisted this was. Her question: "Have you been on TV?" It seems that HGTV aired my episode of Simply Quilts (#827) this morning. She thought the name sounded familiar! She recognized me...probably because I look about the same, just 6 years older! Well, I'm off to see what mischief I can get into before hitting the hay. For those of you reading this late on Thursday, good night. For those reading this on Friday morning, good morning! For those of you who know me, having new entries to anything for four consecutive days is a miracle of the first order. So enjoy your Wednesday and give this some thought. 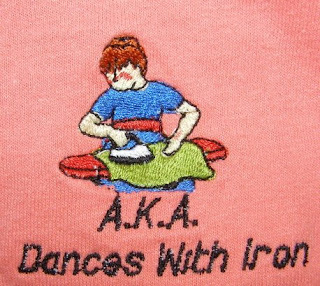 Knowing also that I like to "scoogy dance" with my iron (that's where you wiggle the iron all over the fabric; definitely not the up and down pressing method), she put this logo on one sleeve. "Dances with Iron" is my alias! Now, having said all that, check out this fabric panel! 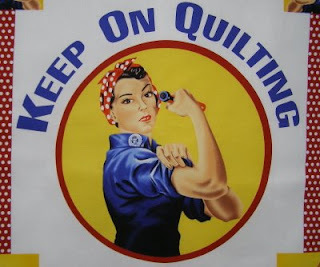 First, I love Rosie the Quilter--no problem there. But look what she has in her hand, right next to her face--AN OPEN ROTARY CUTTER BLADE! I definitely did not hear the click. Did you? 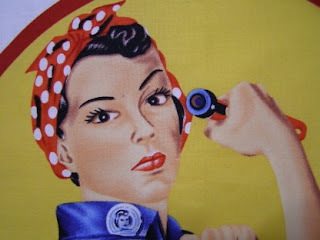 It's such a fabulous graphic for quilting--and great as a place to practice your quilting skills--but if a picture is worth a thousand words, it's going to be an uphill climb to get people to use appropriate rotary cutter safety techniques. Would this have been any less effective an image if the cutter had been closed? A more close-up view of the face/the hand/the rotary cutter. Let me know your thoughts on this--I love getting mail! 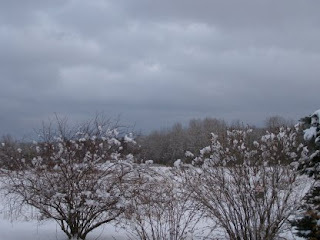 Yes, these are pictures from last year--but I can't wait to see the spring blooms. So I was looking through my pics and decided to share some with you. As many of you know from my website, I have two cats, Tatty and Callie, and one boxer, Lynnie. In late December I had to have Tatty put down--she was 27 years old and had been with me since she was a kitten. She showed up at our house in mid-January, clinging to our screen door--someone had dropped her in a horrible storm. We took her in and the rest, as they say, is history. Although she had gone blind, she could navigate in the house and loved her moist treats. But from Friday to Saturday, she went from okay to definitely not okay. The vet said it was time. I miss her every day--she purred whenever you touched her and loved to cuddle in your lap. 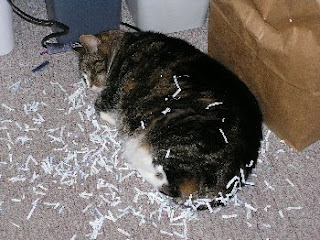 Here's a picture of her after she had torn the bag containing shredded paper and made herself a bed. 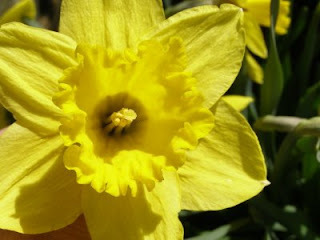 Think spring--it is coming--Mother Nature is just toying with us! In late winter each year, we are overrun with ladybugs. I guess technically they are not true "ladybugs" but rather a species of beetle--blah, blah, blah--I just know that they are each very unique. 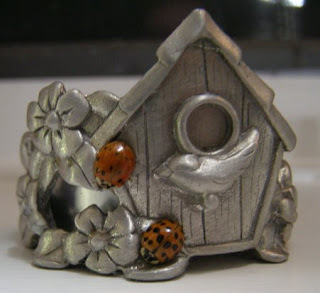 Pictured above is a pewter votive holder where two ladybugs decided to take up residence. Too cute for words! Christmas 2007 saw me as the lucky recipient of not one but two very special gifts from friends/students. 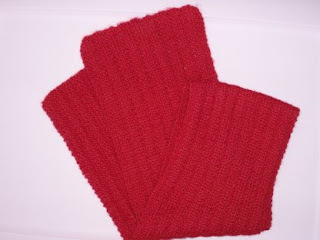 The red scarf is made from baby alpaca yarn--so soft and smooth. Carol R. made it especially for me--I just love it! Barb MacA. 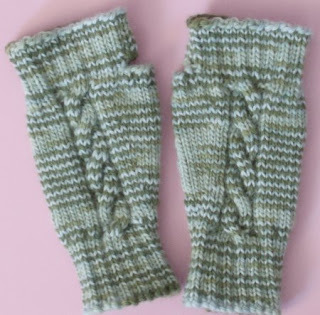 knitted these wristers for me in cashmere yarn on those dreaded double pointed needles. I must admit to putting my scarf and wristers on and running through the house saying "I'm rich, I'm rich!" And I am--with fabulous friends who care about me! 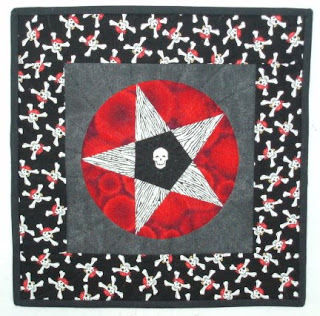 Here's something to strike your funny bone: See the quilt below? Well, I had just finished it last week and I took it to a hand piecing class to show it off. (The borders were put on by machine, but the rest is hand pieced.) A lady from a bus trip sat down at the table, saw the quilt, and said "Who would want that!?!?" I calmly said that I would since I had made it, but that it definitely wasn't to everyone's taste. It was just one of those pieces that I had to get out of my system. You may notice a bit of white stuff around the skull. That's a new batting that I was trying--it bearded with every stitch, so I am definitely not going to use it again. 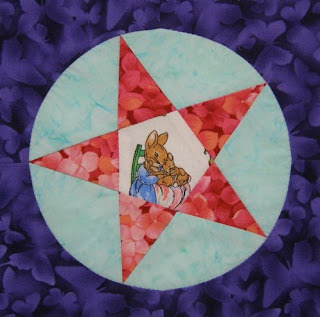 As I do more of these 5-pointed stars for classes, I will share them. 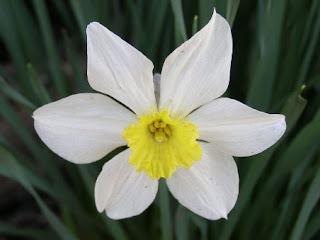 Please note that when you leave a comment from the blog you will be listed as anonymous unless you have a Google account or unless you leave some indicator within your message. It' s so exciting to get mail! 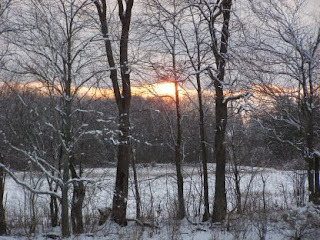 Be sure to visit my website at http://www.sharonstroud.com/ to see my teaching schedule and to visit my student gallery. My workshops and lectures are also listed there, and I do travel to spread the quilting word according to Sharon. 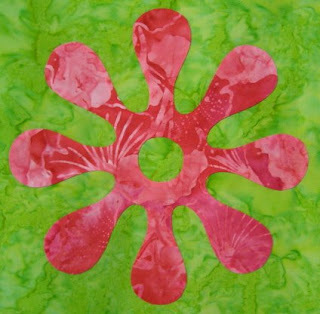 Have a wonderful Monday--may it be filled with quilting! Great news! The American Quilter's Society is reprinting my book on CD! Dresden Plates of Distinction has been out of print for about a year in paper, so I am thrilled that it will again be available. The CD has the entire book on it; you just pop it into your computer and it opens! You can print pages, or just read on the computer screen. It's easy to store and the CD artwork is bright and colorful! Needles and pins, needles and pins--what to do with those used ones. Here are a couple ideas that I use. At home I use salt and pepper shakers to put the used pins and needles in. They are decorative and pretty, and when they are full, I can take all the "sharps" and dispose of them properly. (I know that some of the cheaper salt shakers could probably just be taped closed and disposed of that way, but they are just too pretty to do that!) Those larger-headed pins that we love so much just don't fit into salt shaker holes, so I got a small grated cheese shaker to put near my machine--perfect to drop pins into without taking the lid off each time! 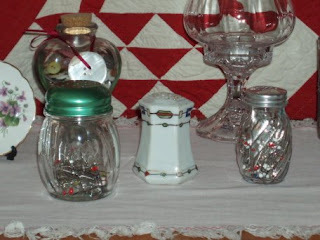 The antique shaker in the center was a gift from a friend (Colette M.); I have it on my windowsill where I see and use it every day. Did you also know that you should change your needles about every 8 hours of sewing? That also goes for the sewing machine--it shouldn't be changed just when it breaks! (You know who you are!) When needles dull, it takes more hand strength to sew, making our hands tired quicker and making us more suseptible to injury. 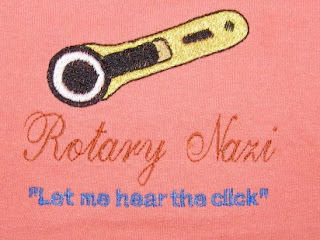 Needles (hand or machine) are the cheapest part of our projects. It's money well invested.